Happy Saturday! I'm popping in with a surprise weekend post today. 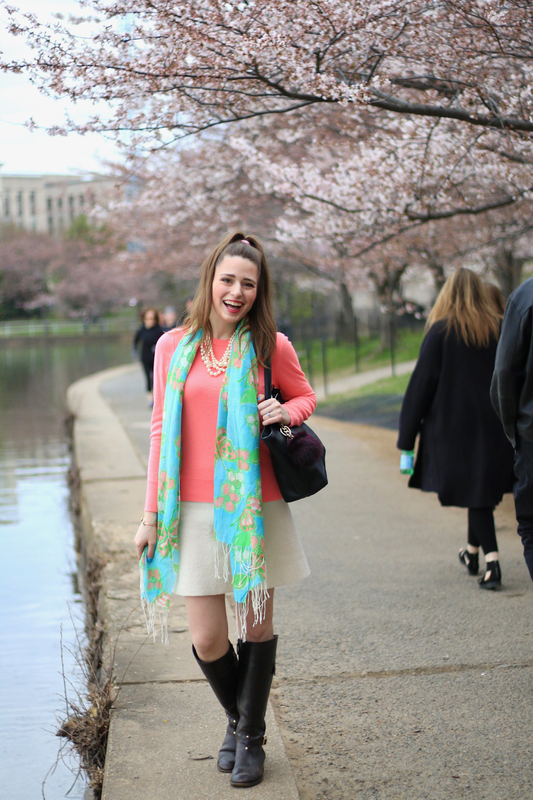 I wanted to share more about the outfit that I wore for Easter Sunday in DC this year! It ended up being chillier than I hoped that weekend, but I still wanted to wear something that reflected springtime, and was perfect for a day of cherry blossom sightings and city exploring. FYI: this outfit was made up completely of older pieces that I already had in my closet so for most items I'm linking similar things, but I was able to find similar pieces for just about everything! I purchased this white wool skirt on a shopping trip in Canada last fall, but I actually never wore it once this winter! Easter weekend in DC had high temperatures in the upper 50s, so I knew that might be my last chance for this season to finally wear this cute skirt (this one is really similar from another favorite retailer of mine!). I brightened it up for Easter with one of my favorite colorful sweaters, and finished the look with a Lilly Murfee scarf (which I later realized the one I wore looks very similar to the DC scarf!). Normally as y'all know I'm all about getting dolled up for Easter with a new dress, but as I had untraditional Easter plans this year and the weather was cooler, this was a much better outfit choice! 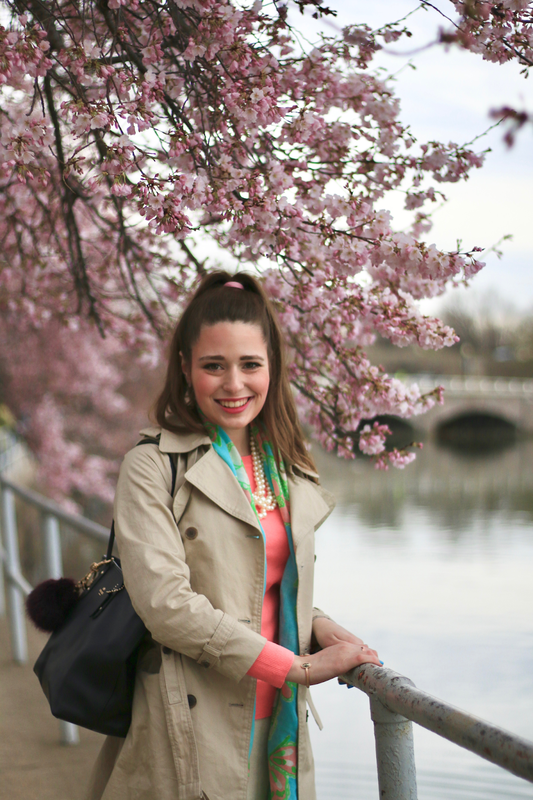 In case you missed my DC travel posts, here is my guide to visiting the cherry blossoms, and here is my post about FREE things to do for a 24 hour or weekend trip to Washington! Enjoy your weekend!! I hope it's a great one! I love wearing simple outfits like this! It is the easiest looks that I can pull off with little effort. I love your whole outfit! I wish it wasn't so cold here in Toronto right now, so the cherry blossoms in High Park would finally bloom! Cherry blossoms are beautiful! We don't get them where I live, but I'd love to travel somewhere where they do bloom in the future so I'm able to see them in real life. So pretty! We just moved from Utah and they had such beautiful cherry blossoms, too. You outfit is so bright and cheery! I've only been to DC once in the spring, a very long time ago, but I remember that the cherry trees were absolutely stunning. I love how that scarf adds such a feeling of spring! Really cute choice. A tour also helpful to take some decisions. A tour gives you several experiences which is beneficial for you. A tour make your boring time into quality time. A tour like https://www.imanali.in/manali-tour-package-amritsar gives you several opportunities for learning. A tour also gives a best opportunity for increasing your efficiency. It is a best option for relaxing yourself and go far away all the issues. A tour also like dream come true. Some places seems like a dream when you are travelling like that place then you may feel that your dream come true. Weekend vibes are the best. One can plan a tour to nearby places but, the confusing situation is when one has to decide the outfit as per the weather and environment.